Nike logo: Swoosh designed at Portland State University was bought for just $35. In 1971, Phil Knight—who now has an estimated net worth of $19 billion—was teaching accounting at Portland State University. The assistant professor had a side business called Blue Ribbon Sports. It was an athletics company founded with the intent of taking on Adidas and Puma, then the biggest players in the shoe game. Knight’s first play was to distribute Japanese sneakers, but that deal fell apart due to manufacturing concerns. So the Oregon native decided to start making his own shoes. His company, now known as Nike, didn’t have a name at the time. It also needed a logo. Knight found his designer on campus: Carolyn Davidson, a graphics design student at Portland State. According to OregonLive.com, Knight overheard Davidson talk about how she couldn’t afford to take a painting class, so he approached her with a pitch, asking if she’d like to do some freelance design work for the young company. She kept doodling, and two or three weeks later—again, there are no records of the date—Davidson presented her work at the Blue Ribbon offices. She presented a handful of designs to Knight and his business partners. They didn’t adore any of them, but one curvy check mark seemed better than the others. “Well, I don’t love it,” Knight said, “but maybe it will grow on me.” By June 18, 1971, the logo was registered with the U.S. Patent Office. 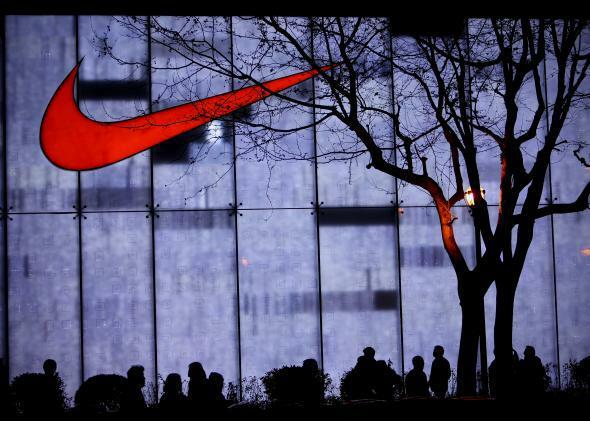 To Knight’s credit, although he bought Nike’s now-iconic logo for just $35, he was more generous later on. In 1983, as the company boomed, Knight and his cofounders threw a party for Davidson. They gave her a gold ring with a swoosh on it, plus 500 shares of Nike stock. Today, those 500 shares are worth $643,000. Davidson graduated from Portland State in 1971, and she worked with Nike until 1975, when she decided to go freelance.